I had heard this place offered some of the best burgers in town although I can’t remember which website I read this on. The only local Raleigh burgers I’ve had the chance to sample since I’ve been here are Char Grill, which are delightfully charred on the outside, albeit a bit thin and small. Five Guys are hand formed and never frozen. I was initially disappointed when I walked in because these are cooked on a standard flat griddle rather than a grate over charcoal or a gas grill. But these babies were tender and delicious, and the fries were amazing. Normally fries are a sideline item but these could be the star of a meal if you wanted. They’re fresh cut daily. Here’s the list of top five Raleigh everything (including burgers) according to a local blogger vs AOL City Guide. 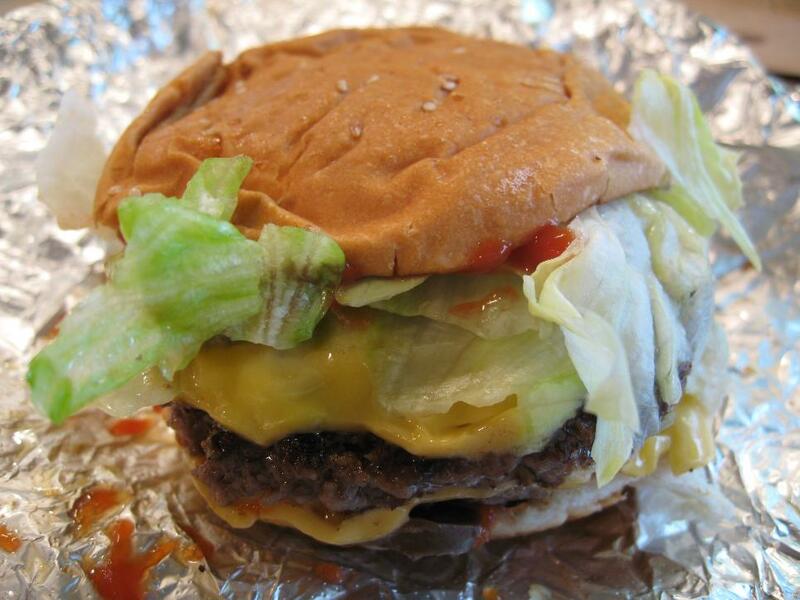 Here’s a review of one of the original Five Guys locations by Roadfood, one of my favorite foodie blogs. Dude, we have a five guys in state college and it is AWESOME! I love love love their burgers and fries when I’m feeling like its a good day to get fat.